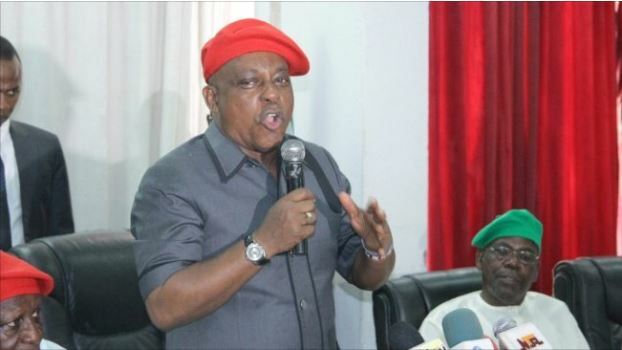 Uche Secondus, national chairman of the Peoples Democratic Party (PDP), says it is consulting various interest groups and political stakeholders for synergy to regain power in 2019 elections. Secondus made this known at an emergency national executive committee (NEC) meeting of the party on Thursday in Abuja. He said the consultation with the groups was useful, and that in coming days, a broader platform would be raised to wrestle power from the All Progressives Congress (APC). The PDP, he said, had taken it upon itself as the leading opposition party to broaden its scope, open its doors and allow ideas to flow in for a more robust democratic process. “Our consultations have taken us to meet with various interest groups, who are willing to do business with us,” he said. He hinted that all former presidents and former leaders of Nigeria were in unison to make sure that in 2019 a fresh and new government was formed in the interest of the nation. Secondus called on members of the party and other political parties to join forces to rescue power from the APC. “We, therefore, invite our brothers, sisters, youths and women from other political parties in this platform to join us to rescue our country that is in distress, socially, politically, economically and security-wise,” he said.